Enter the length and width of the space where you want to put the wall mural. 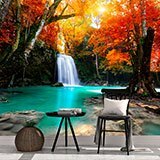 Wall mural Deep waterfall in autumn. 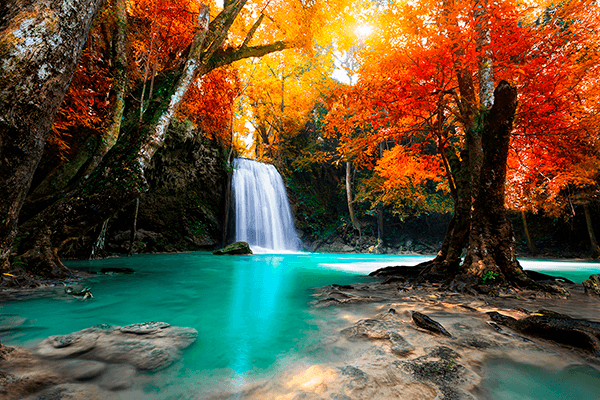 Fascinating waterfall in the middle of a natural park with leaves dyed in red and yellow tones. The colour of the water is an astonishing light blue. 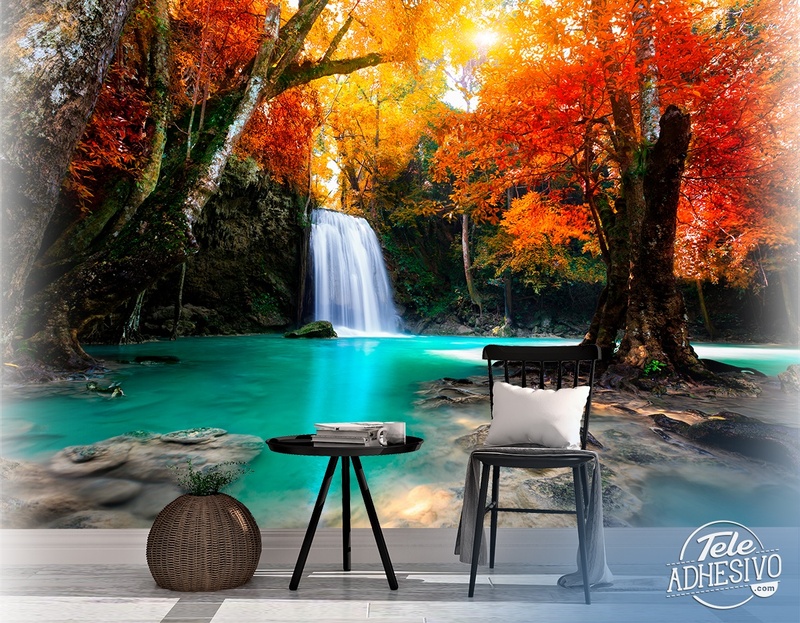 Decorate the wall of any room in your house with a scene as spectacular as this and disconnect from routine. Size: 37 x 25 cm. The wall mural is used on one or more panels at a maximum width of 130 cm. On canvas material, the panels will be 100 cm in width, and the maximum length per panel will be 3 meters for any type of material. 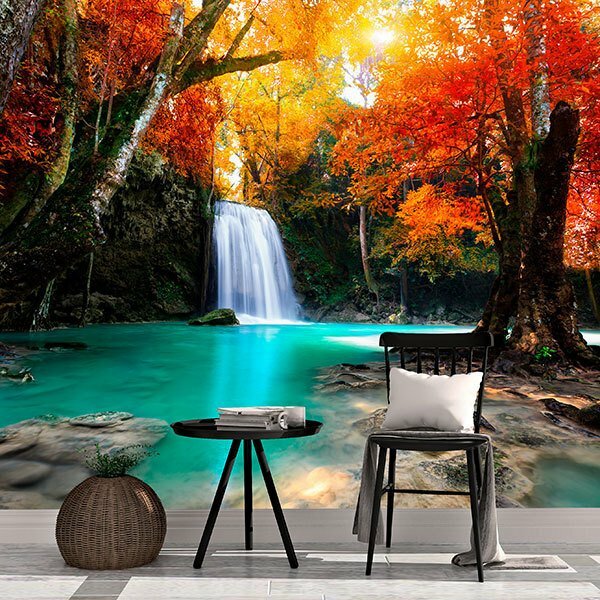 All wall mural panels include an overlap of 1 cm in order to lap over each other, thus creating a clean, simple installation, since this overlapping is practically imperceptible. The paneling is generally installed vertically according to material usage standards. If the customer so desires, you may contact us so that we do not include the overlap on the panels. Also, we offer the possibility of customizing the mural. Send us a photograph or image by email and we will provide you a written quote. Selfadhesive Smooth satin finish. The calendared white satin polymer vinyl is ideal for photo murals that will not shrink or stretch after installation. Excellent printing quality. Suitable for most walls, tested and recommended for application over many kinds of painted surfaces. Canvas Paper Canvas-style texture and matte finish, ideal for murals of paintings or famous works. Printed on a solid sheet, with inks protected against UV rays for up to 20 years in interior spaces. Material is washable with water and pH-neutral soap. Translucent Acid-etched vinyl for printing and with an identical look on both faces. Smooth matte finish, Can be applied to glass surfaces and windows. Tear-proof and easily washable with water and pH-neutral soap. Watch our videos and discover just how easy it is to mount our wall murals in just a few simple steps. There is a video for each type of material. You get a full set of instructions and a squeegee free with every order.